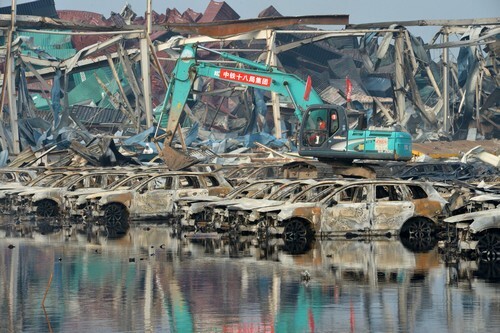 Large numbers of dead fish spotted offshore near the Tianjin blast zone have been examined and no hazardous cyanide compounds have been detected, the Tianjin municipal government said on Thursday night. 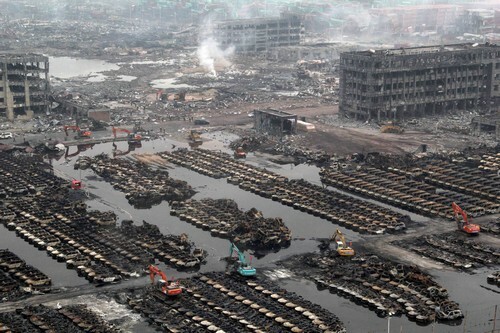 However, the cyanide levels in the core zone were 356 times higher than the national safety standard. 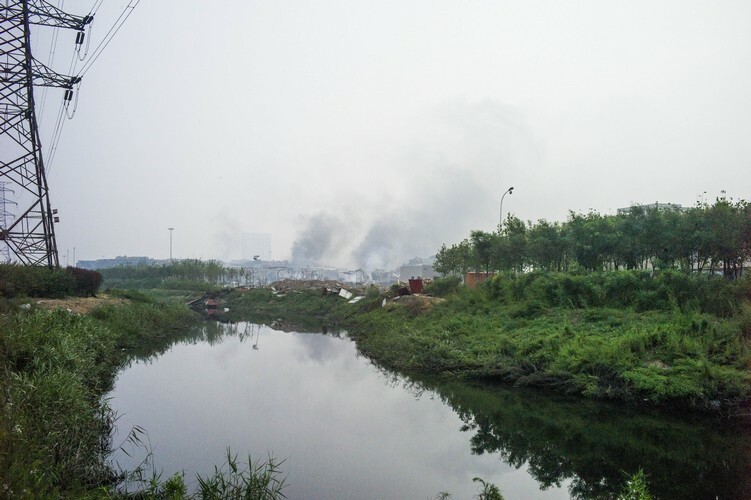 Outside the zone, monitoring of air and water quality has found no abnormal rises, and the authority has increased the monitoring of soil pollution. 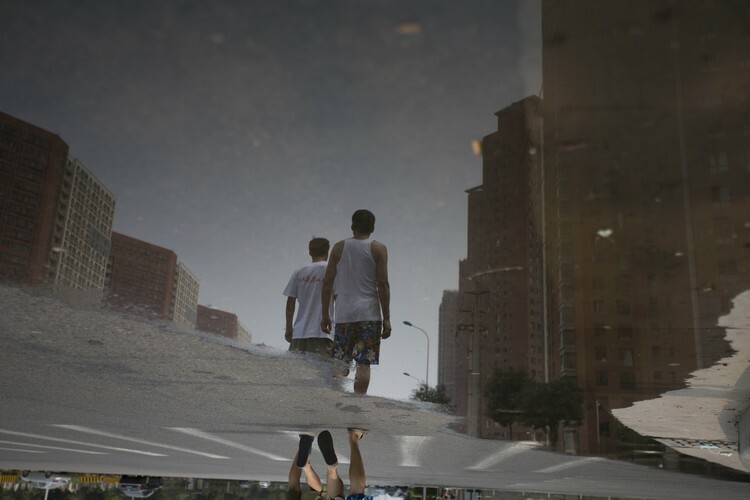 A belt of dead fish along the shore of Haihe River Dam has appeared, with pictures going viral online. 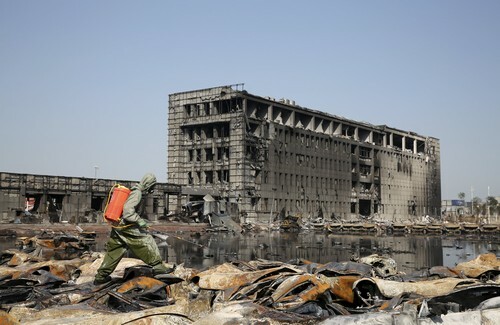 The pictures have raised public speculation that the hazardous chemicals from the blasts have contaminated the water. 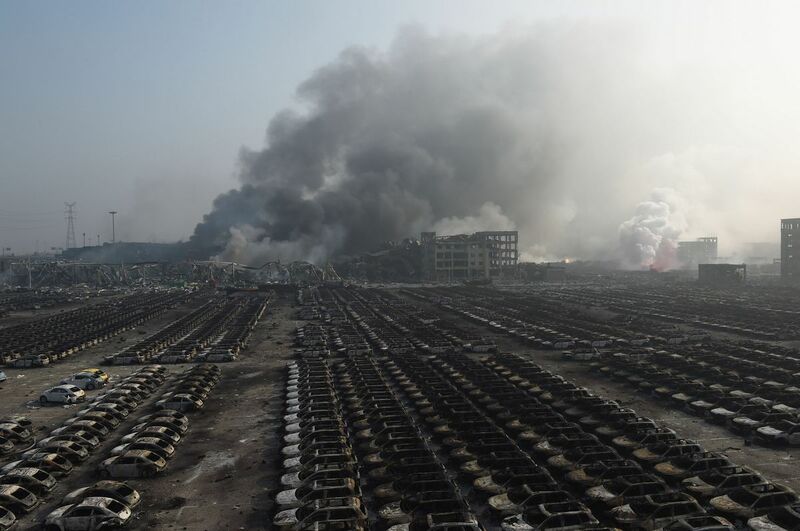 Experts have gone to the site to collect samples for further investigation, said Deng Xiaowen, head of environmental monitoring for the Tianjin Environmental Protection Bureau, at a news conference on Thursday afternoon. 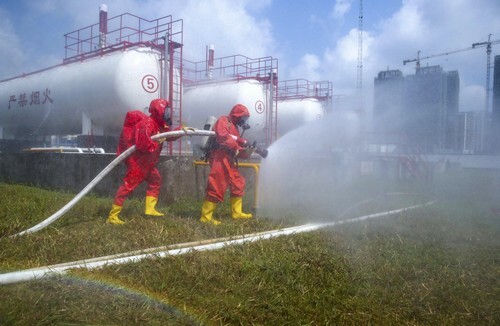 The municipality announced that there were no toxic cyanide compounds in the offshore water samples at 8 pm. 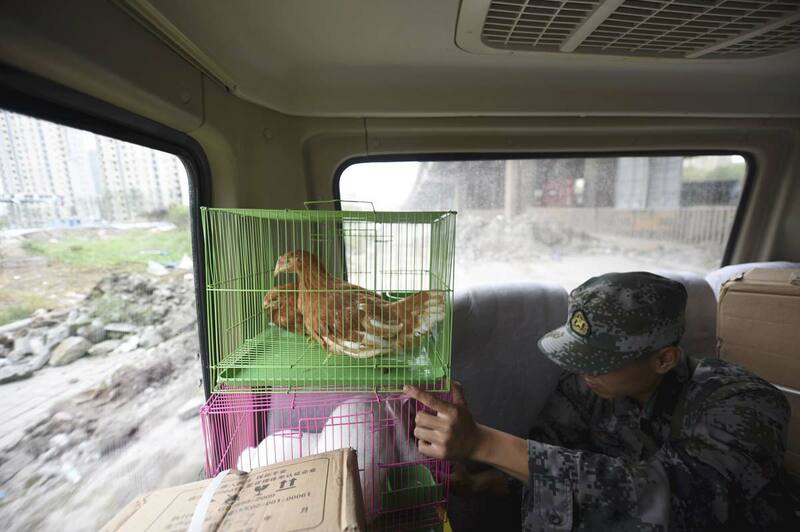 Cao Shuxiang, from the fisheries bureau in Tanggu district, collected the water and fish samples at 5:30 pm, saying that it's not rare to see dead fish offshore in summertime due to a lack of oxygen in the water caused by excessive nutrients. 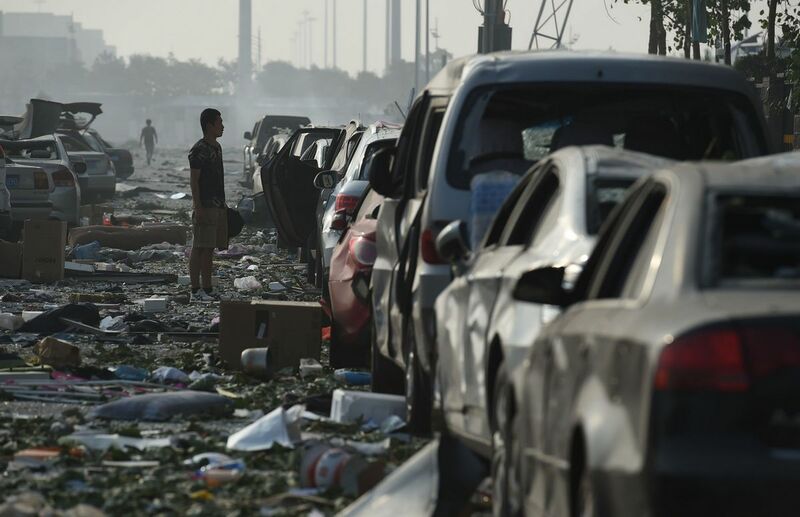 Yan Chao, a Tianjin resident for 15 years, said he has seen dead fish every year, but not in such large quantities as this year. 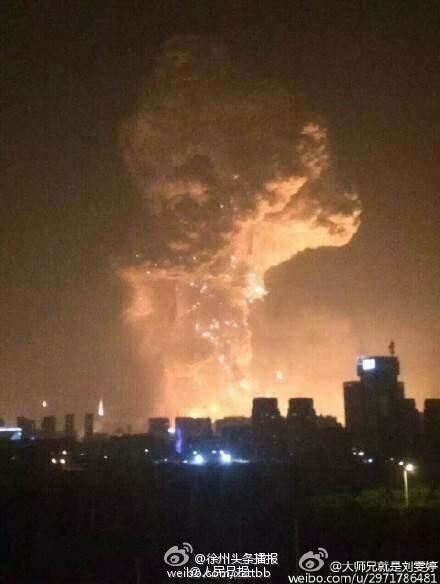 "It's acceptable for us to feel worried about the contamination from the blasts. 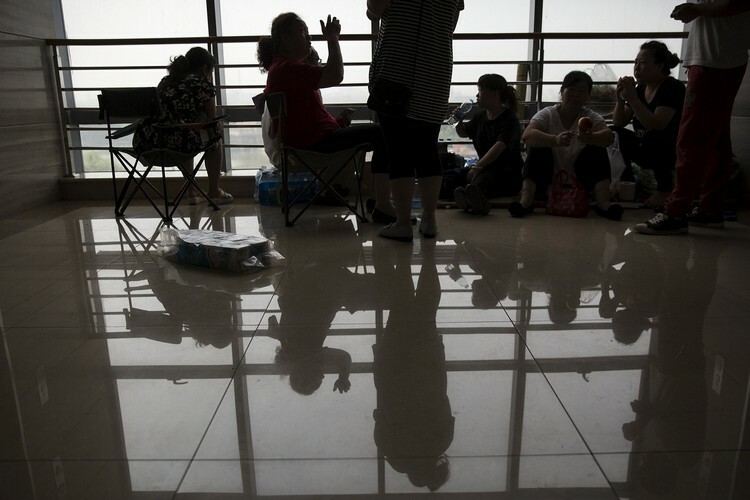 But I will believe the official results," he said before the results were released. 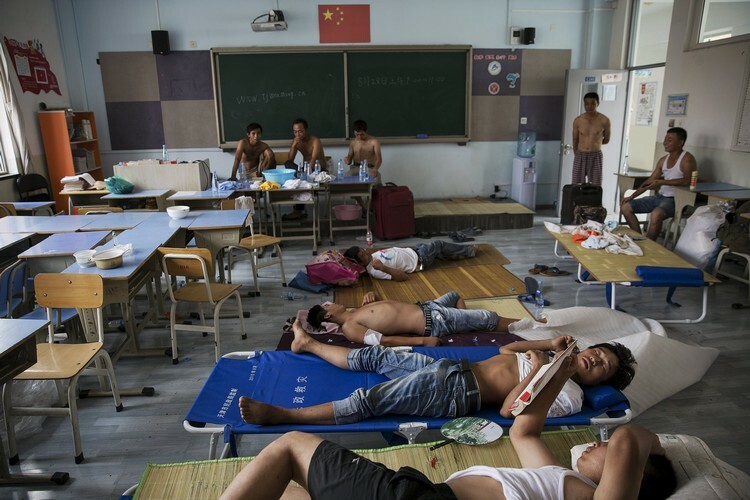 Environmental monitoring experts have detected some cyanide compounds in seawater from five monitoring stations near the blast zone, but they are in the normal range compared with the average level in past years, Deng said. 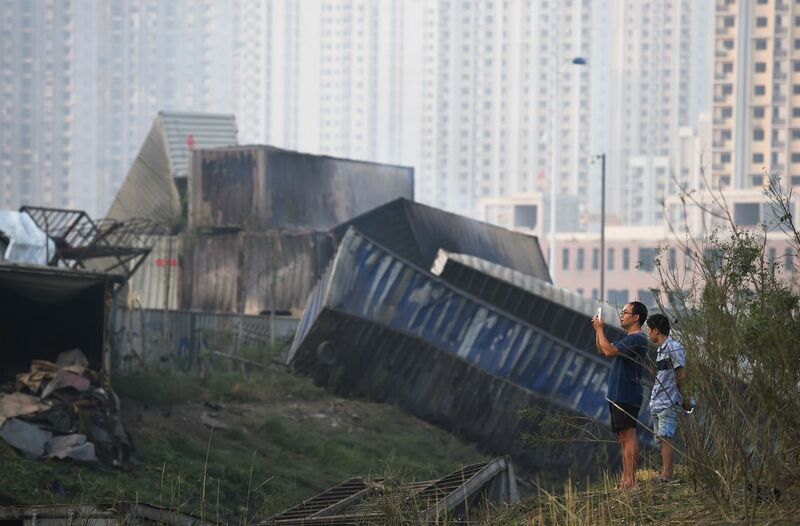 Tian Weiyong, director of the environmental emergency centre under the Ministry of Environmental Protection, backed Deng, saying the monitoring station data cannot be false because more than 90 nationwide monitoring experts have supervised the tests together. 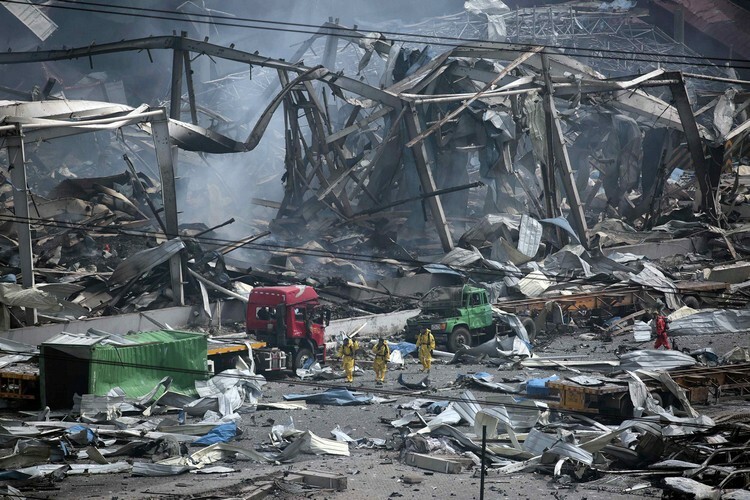 Among the 42 water quality monitoring stations, 19 stations within the cordoned-off area around the core zone have detected sodium cyanide－a highly toxic chemical stored in the warehouse where the blasts occurred, Tian said. 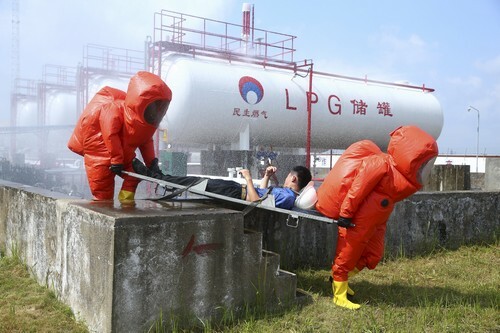 Eight of them have found the concentration of the chemical to exceed national standards. 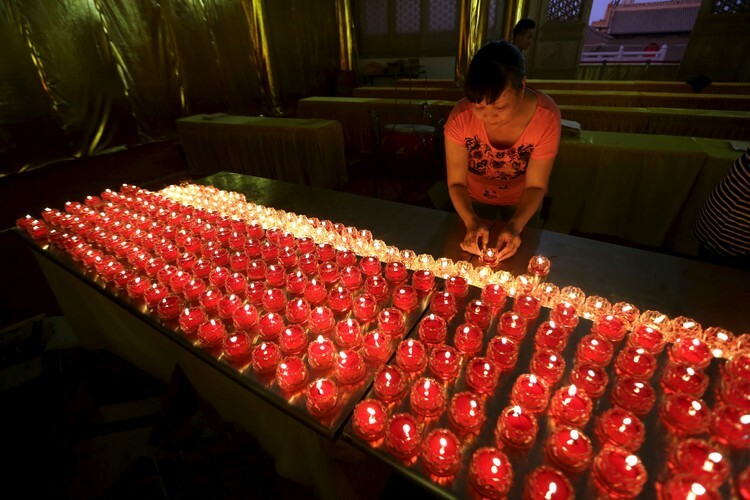 "The largest concentration has been 356 times the national standard," he said. 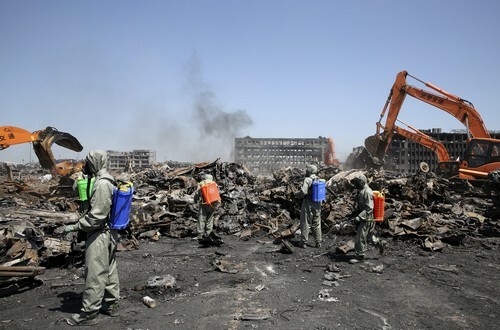 In the areas outside the core zone, some stations monitoring water quality have detected the toxic chemical, but it has been within the national standard, said Deng of the Tianjin environmental authority. 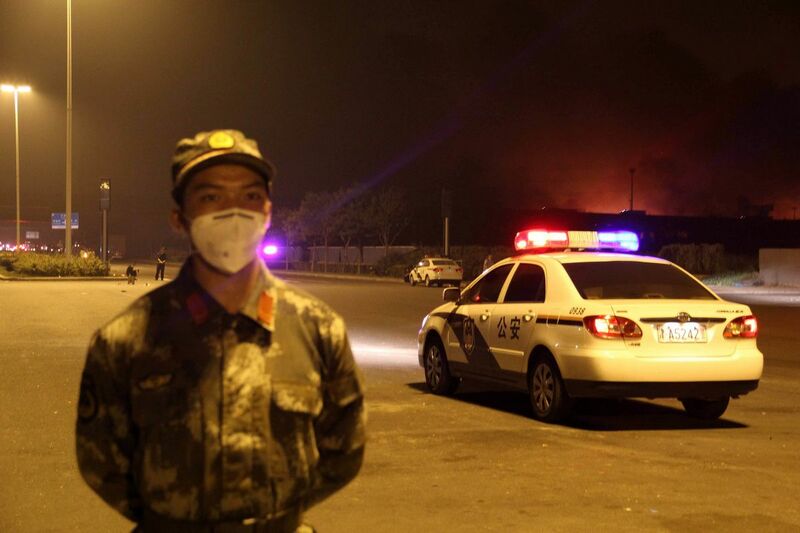 Additionally, the air quality inside and outside the zone had no abnormalities on Wednesday, he said. 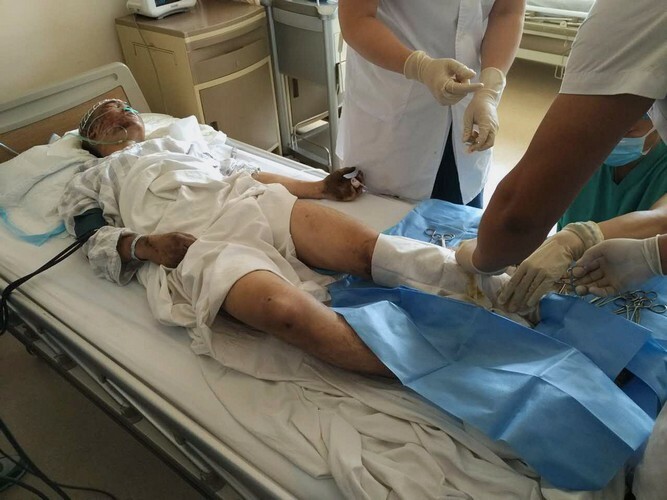 Authorities have set up 73 grids in an area covering 5 square kilometers around the zone to detect and treat soil contamination, another focus of treatment in the future, Deng said. 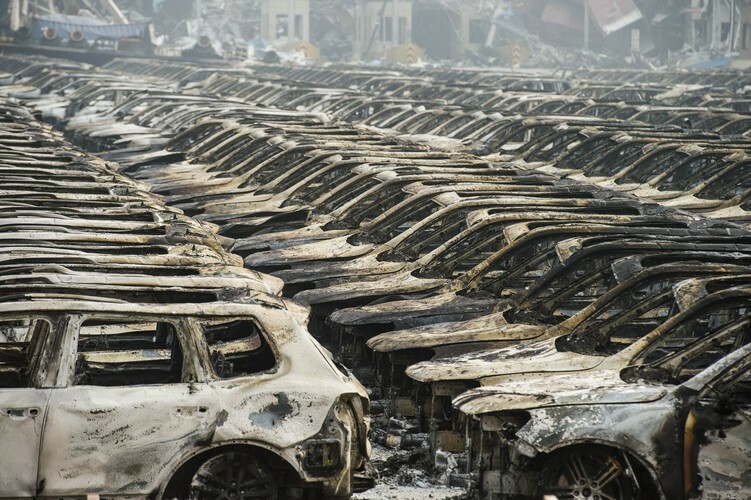 China's powerful State Council, or cabinet, has vowed to conduct a "rigorous" investigation into the cause of last week's explosions in the northern port city of Tianjin as the death toll rose to 121. 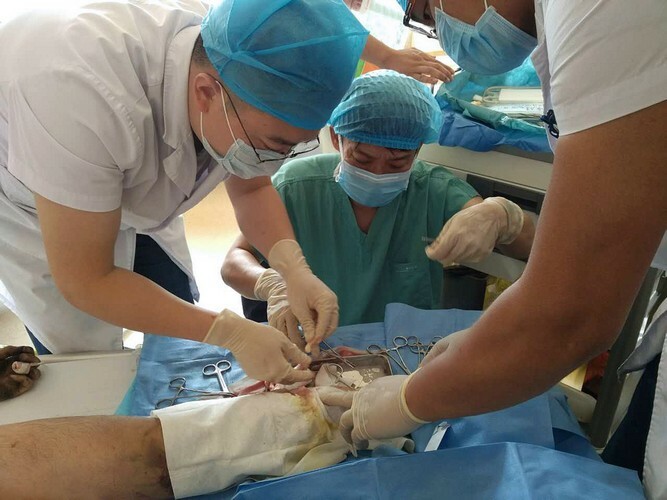 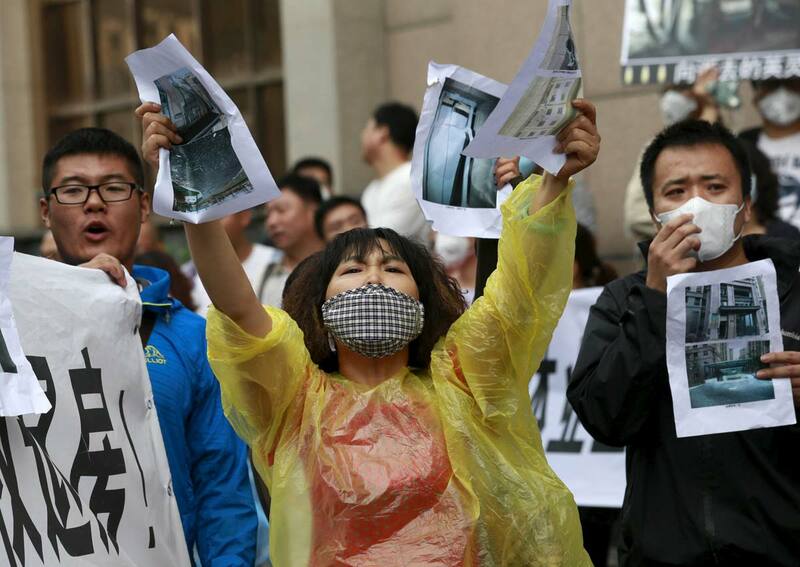 The government will publish the findings of the investigation, which it pledged would be timely and accurate, the official Xinhua news agency reported. 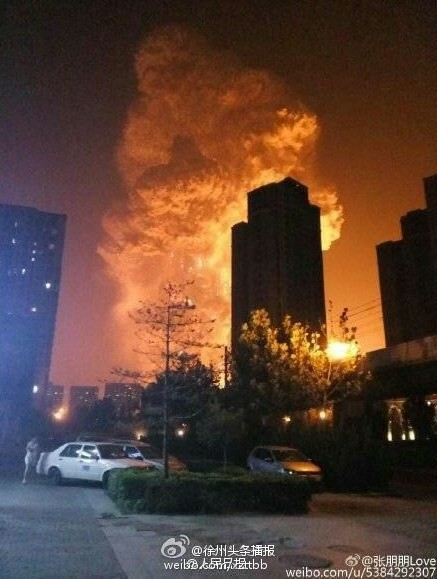 The explosions at a hazardous goods storage facility on August 12 triggered a giant fireball and new fires broke out as recent as Friday. 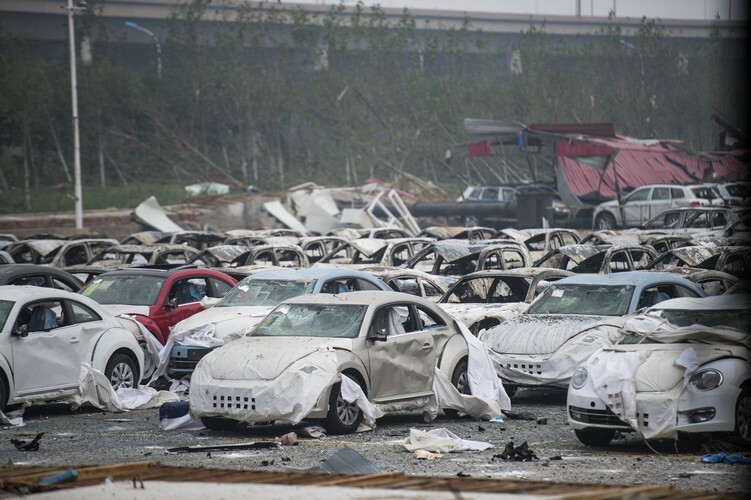 The death toll rose to 121 on Saturday, up from a figure of 116 the previous day. 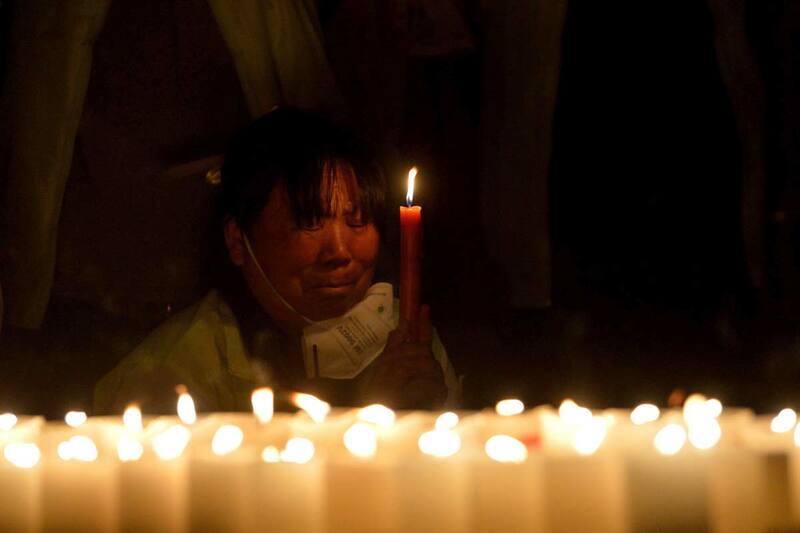 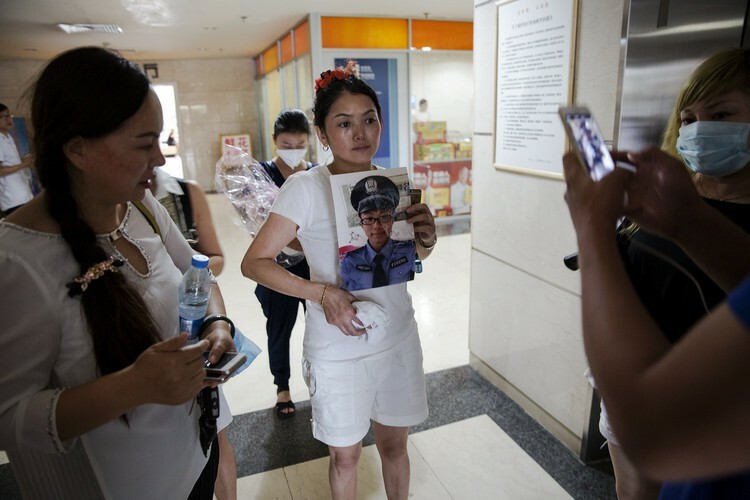 Some 54 people remain missing, Xinhua said in a separate report. 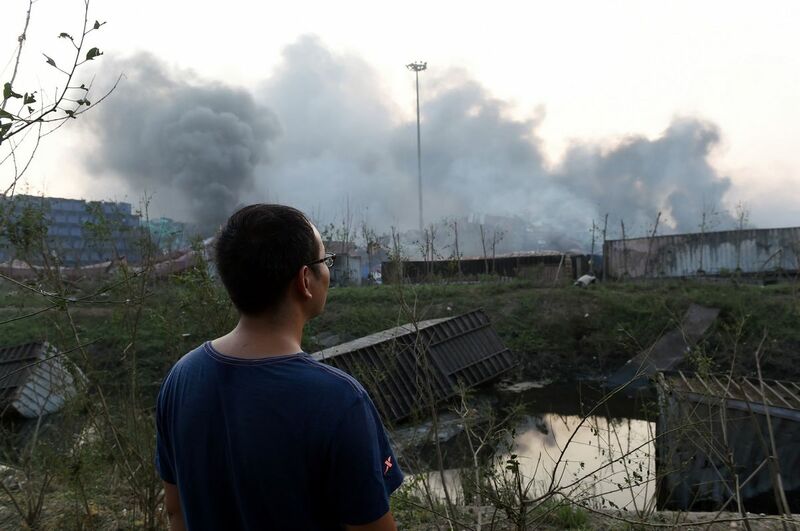 Residents and others have questioned how hazardous chemicals could have been stored close to residential areas. 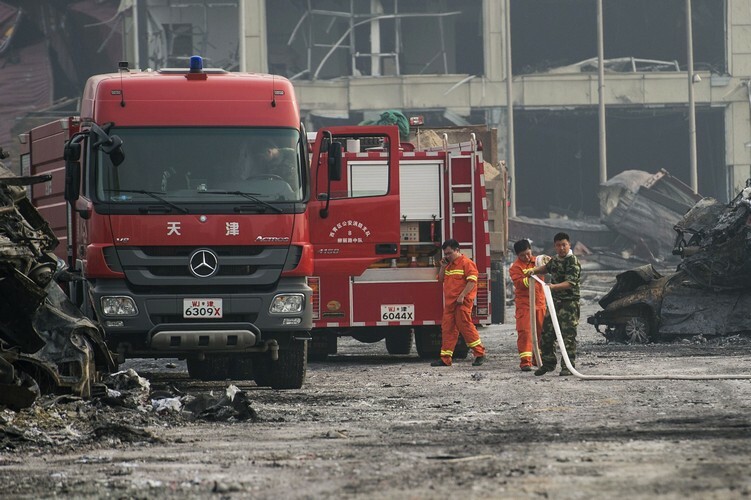 The owners of the hazardous goods storage company at the centre of the incident, Rui Hai International Logistics, reportedly included the son of a former police chief who used his connections to help the firm obtain the necessary permits and pass inspections. 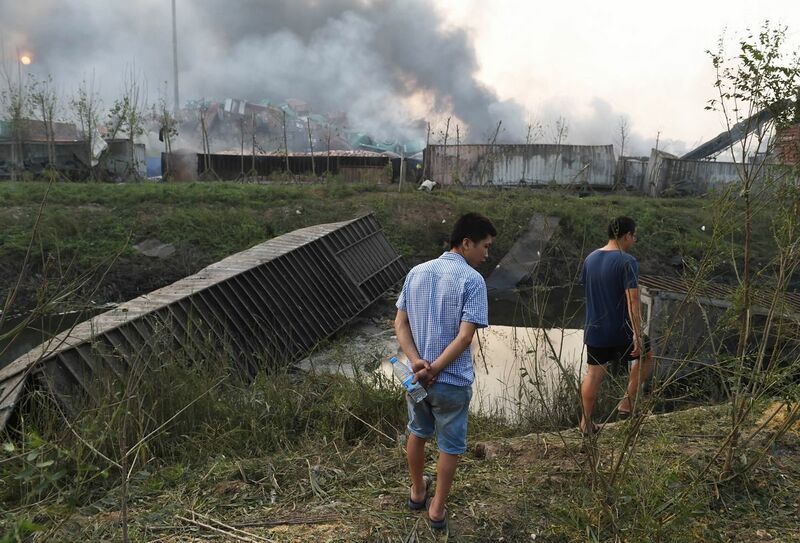 The blasts have also sparked fears of toxic pollutants contaminating the air and water of the city, which has a population of around 15 million people. 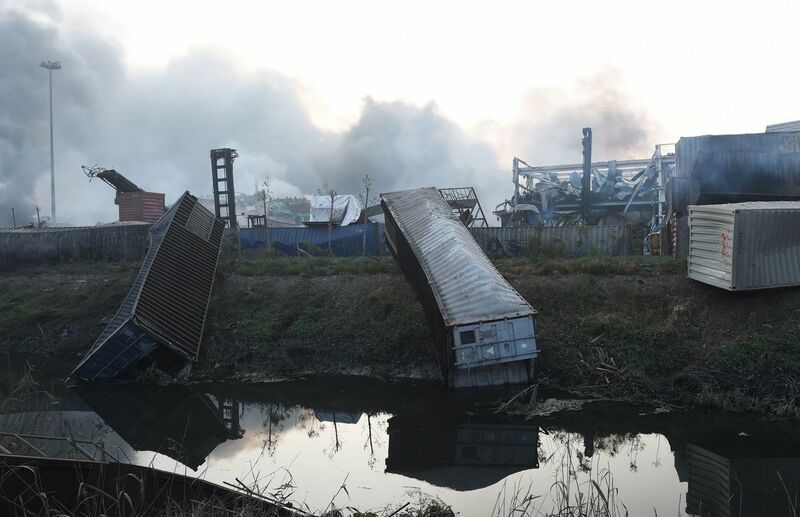 Thousands of tonnes of hazardous chemicals were stored at the site, officials have said, including about 700 tonnes of highly poisonous sodium cyanide, a white powder or crystal which can give off lethal hydrogen cyanide gas. 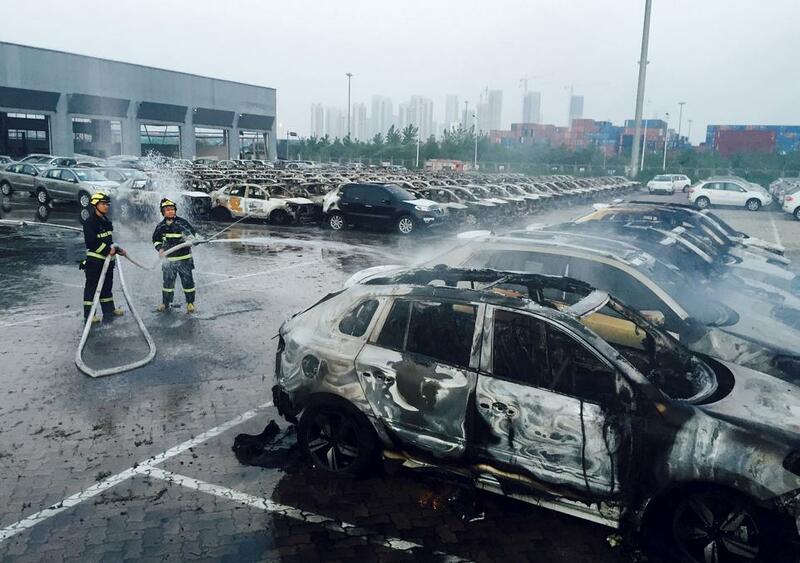 Toyota Motor Corp. said on Friday more than 50 of its employees were injured by Wednesday night’s explosions in the Chinese port of Tianjin that killed 56 people. 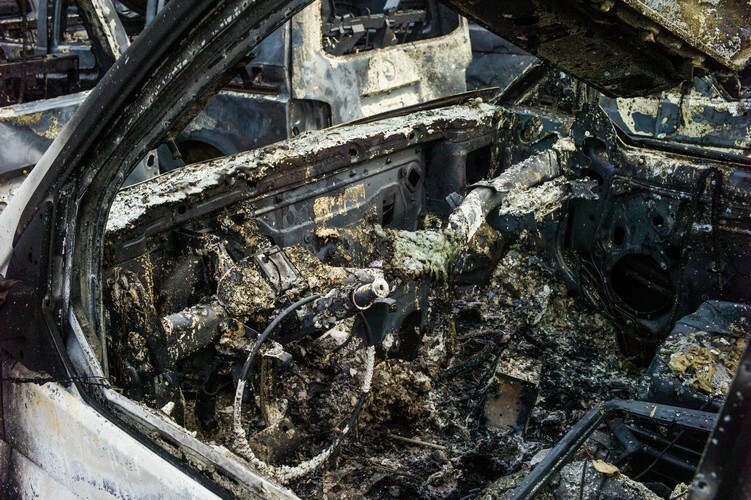 It said it was not aware of any deaths of Toyota personnel. 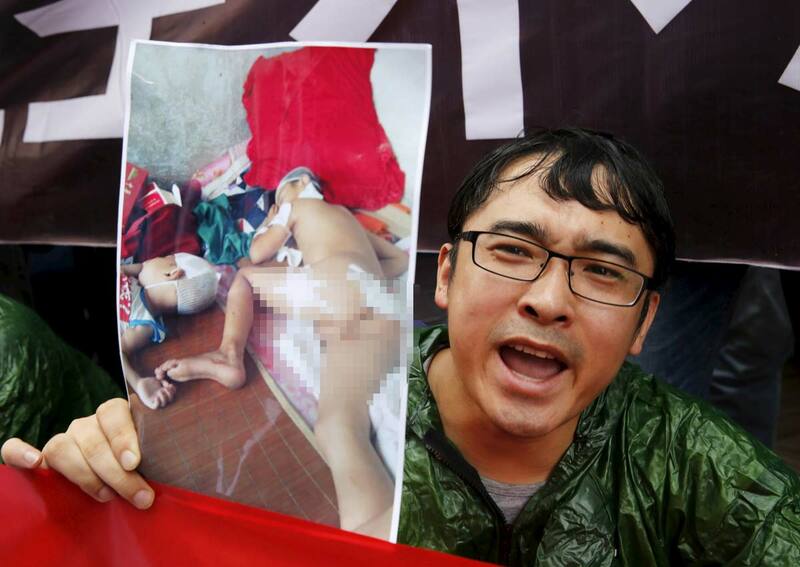 An evacuated resident protests while holding a picture of his neighbour's children who were injured. 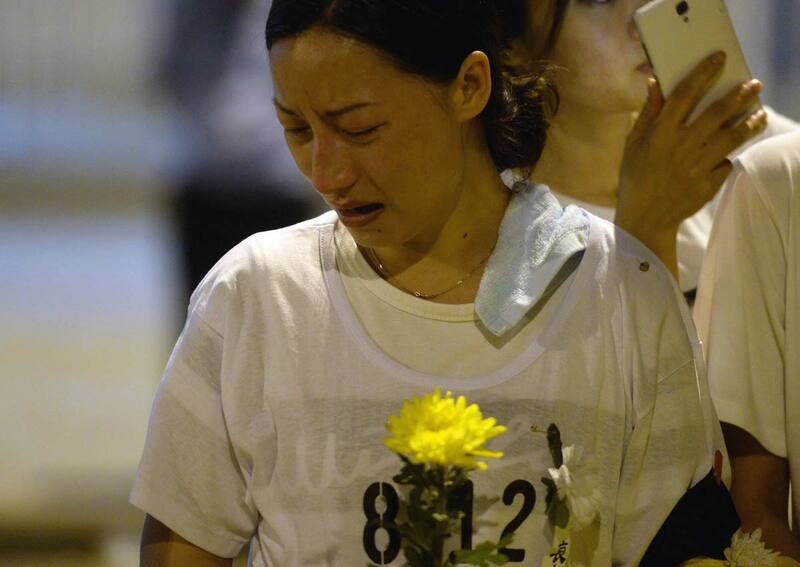 An evacuated resident protests in front of her damaged house in Tianjin. 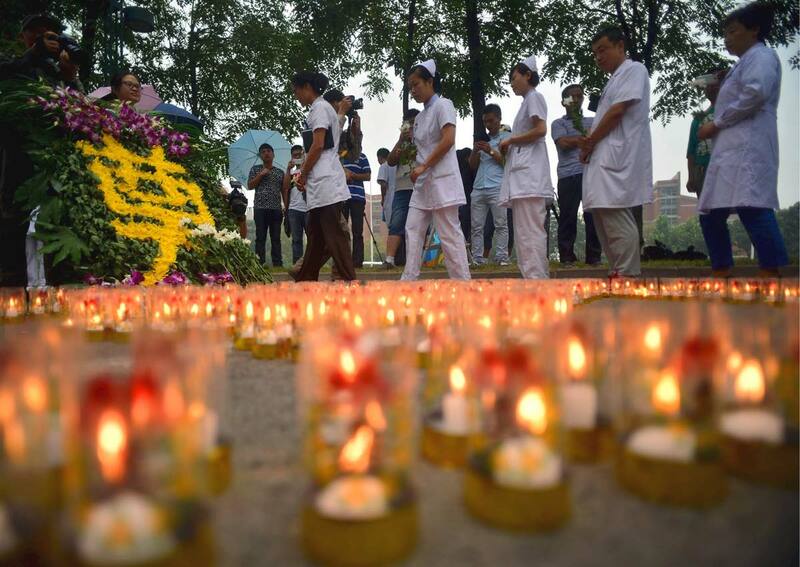 A tribute to the victims at Binhai. 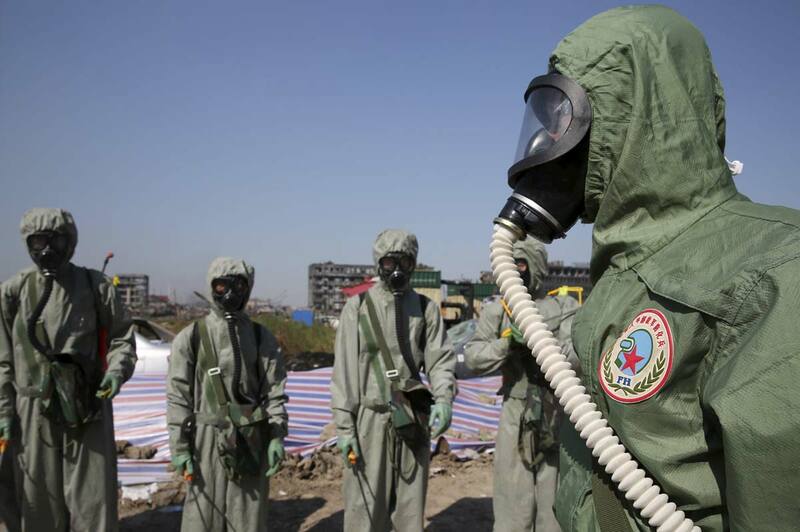 Soldiers in anti-chemical warfare attire at the blast site. 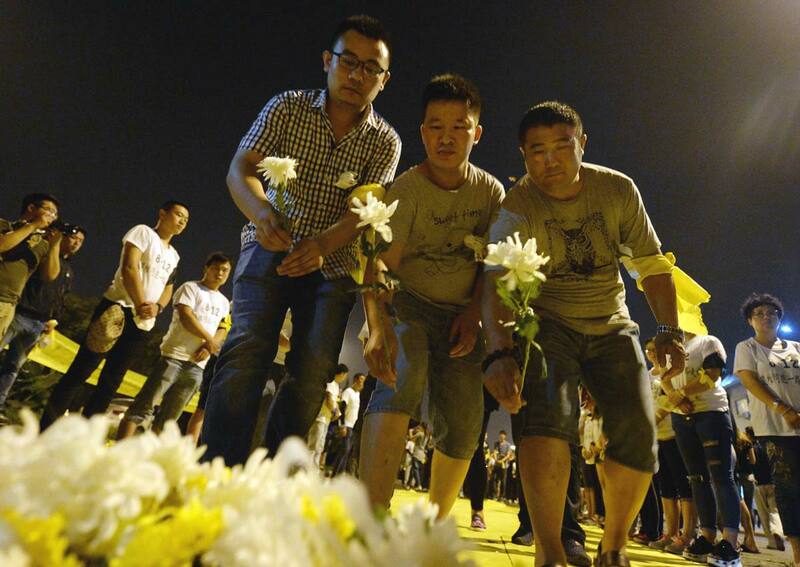 People laying flowers in tribute to victims of slipshod practices. 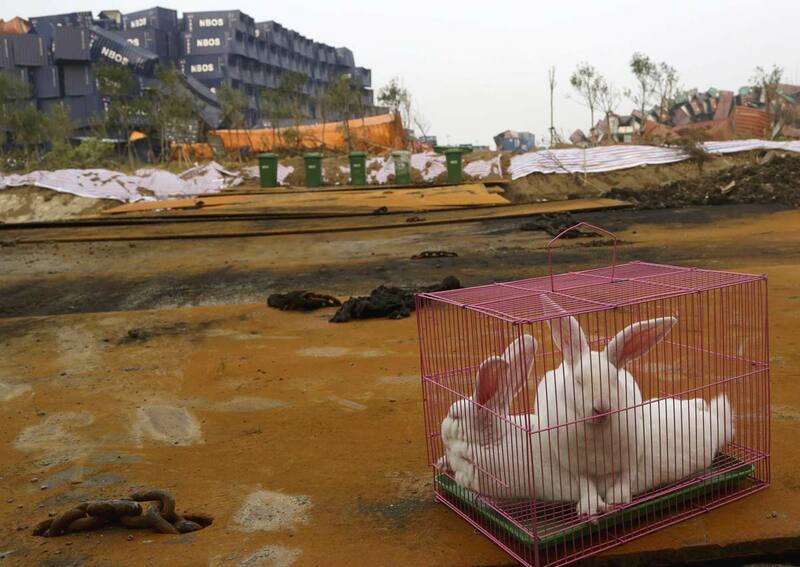 Animals in cages are used to test the blast areas for safety hazards. 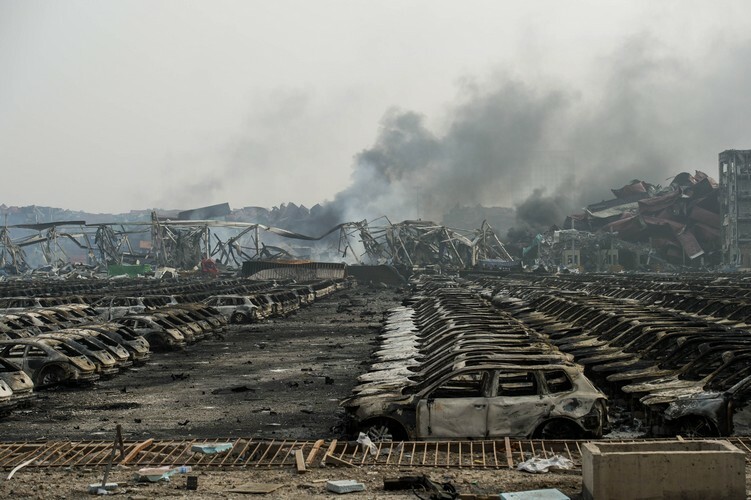 Chinese authorities struggled Friday to extinguish fires and identify dangerous chemicals at a devastated industrial site, two days after giant explosions killed dozens and left residents in fear of being cloaked in a toxic cloud. 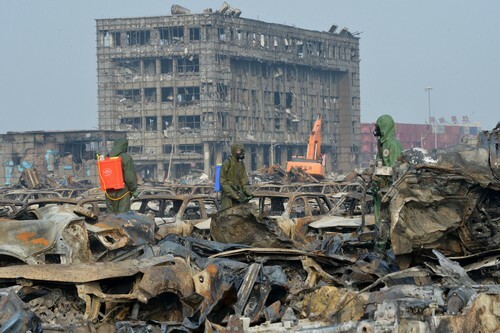 Officials in the northern port city of Tianjin, where the blasts killed at least 56 people and injured more than 700, told a news conference they did not yet know what materials were at the hazardous goods storage facility that exploded, or the cause of the blast. 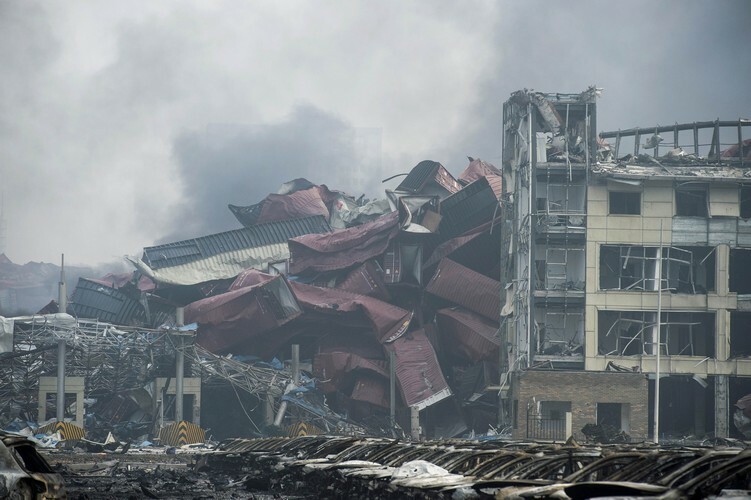 But Chinese media and environment group Greenpeace warned a host of potentially extremely dangerous chemicals may have been stored there. 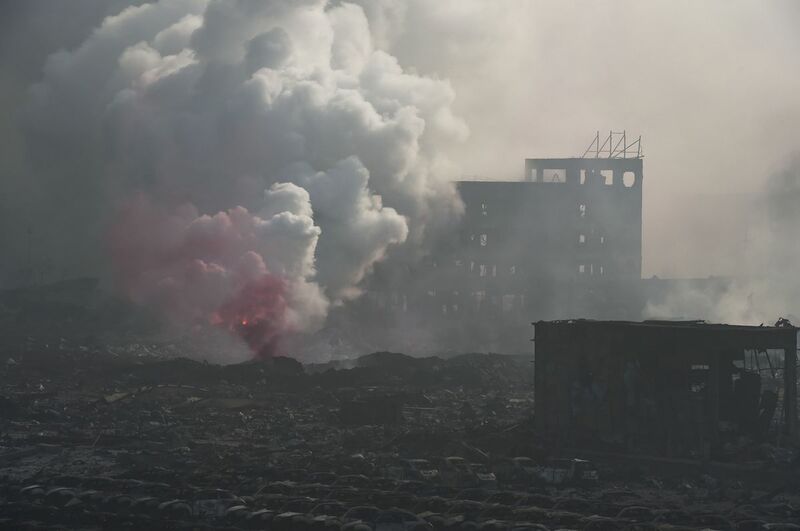 At least 700 tonnes of sodium cyanide were at the site, along with other dangerous substances, and the poisonous chemical had been detected in nearby drains, the Beijing News initially reported. 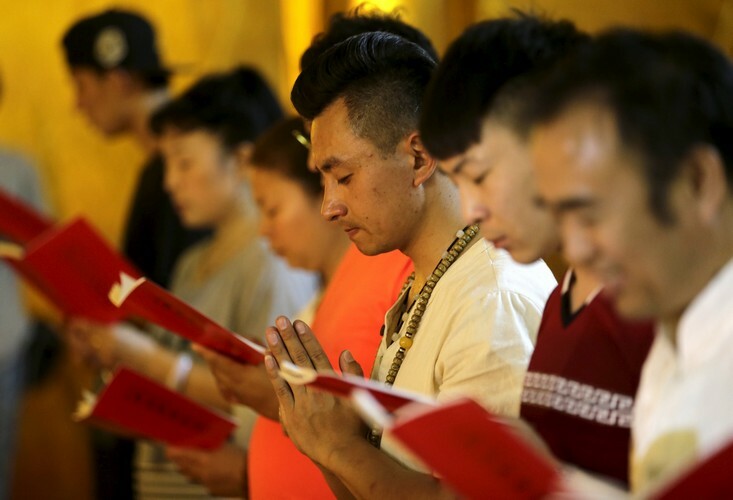 But the report was no longer available on the newspaper’s website on Friday, giving rise to suspicions that the Chinese government was clamping down on sensitive information relating to the tragedy. 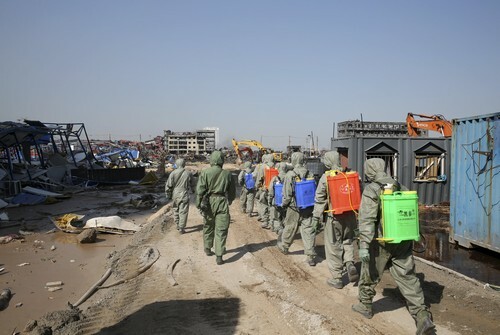 The official Xinhua news agency said a team of 217 nuclear and biochemical materials specialists from the Chinese military had travelled to Tianjin to inspect the site. 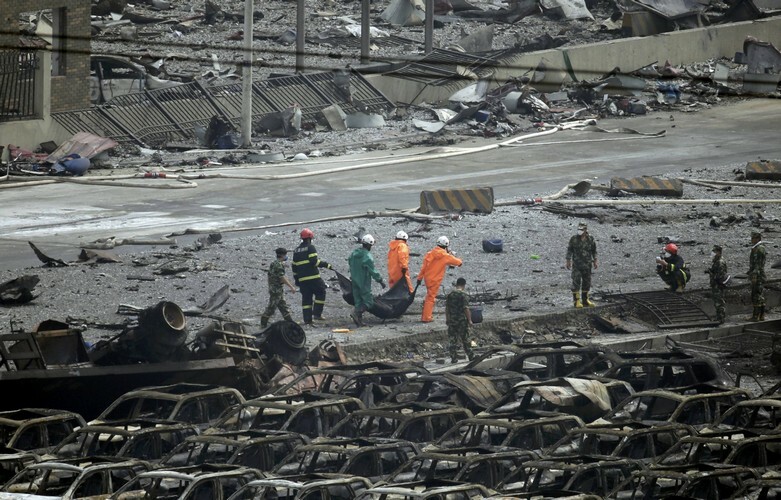 Xinhua cited local authorities for the latest rise in the death toll to 56, which it said included 21 firemen. 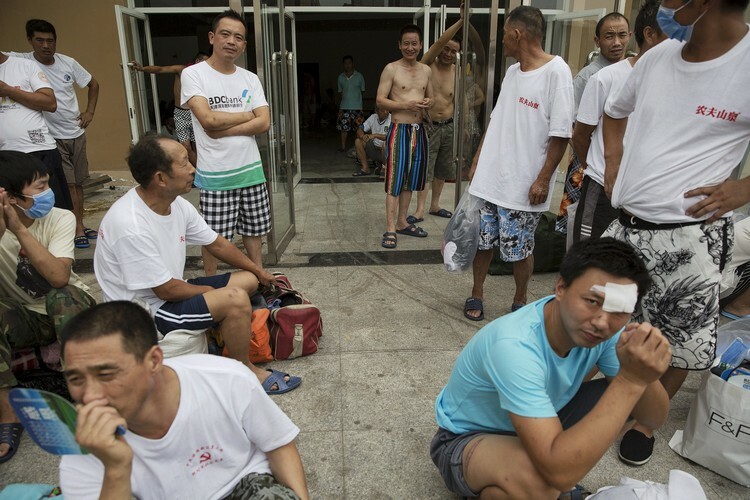 The agency added that 721 people had been hospitalised, 25 of whom were in critical condition. 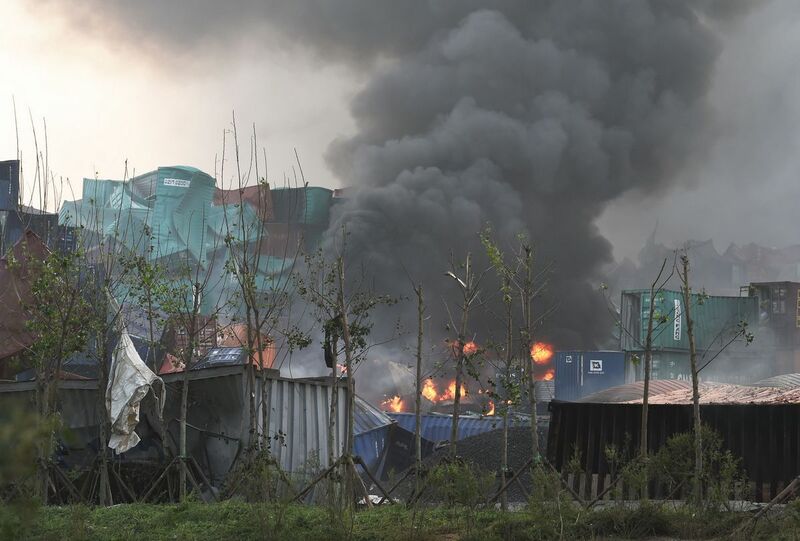 However up to 1,000 firefighters were still struggling to extinguish blazes at the site, with smoke billowing from three areas, adding to uncertainty over whether more chemicals may be leaking. 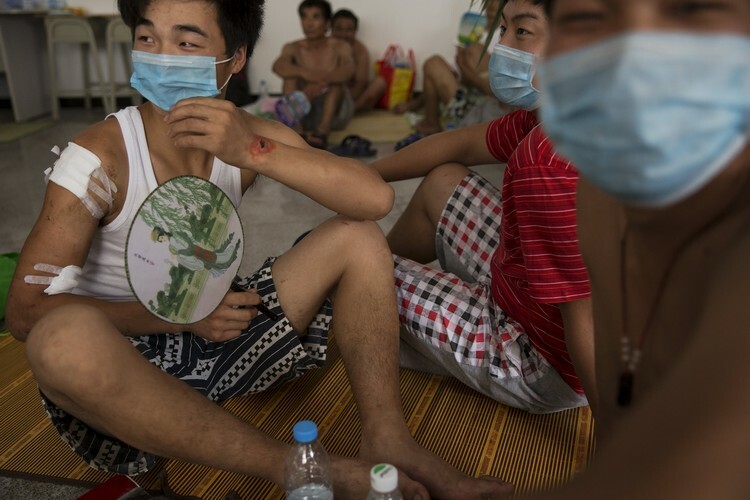 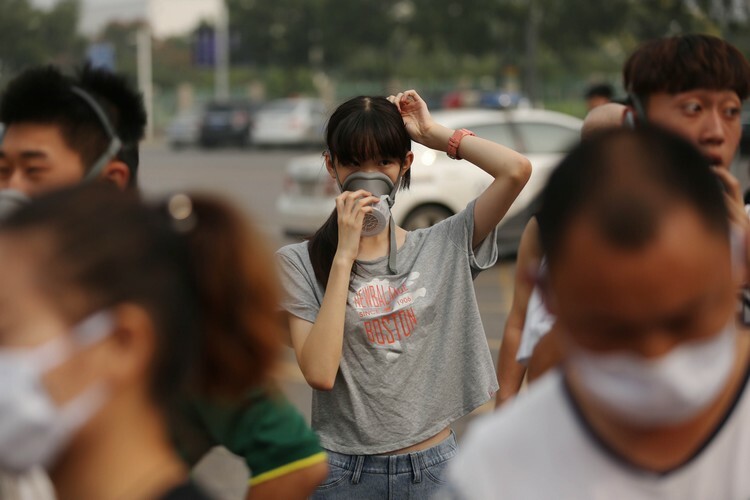 Some police wore no protective clothing, while others had full-face gas masks, although an environmental expert told an official press conference that toxic gas indicators were within normal ranges and the air “should be safe for residents to breathe”. 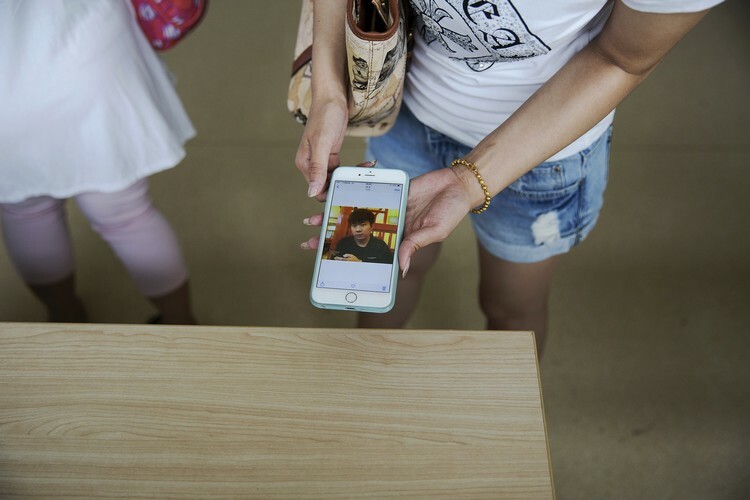 Dozens of people were still missing but there was a rare moment to cheer on Friday morning when rescue workers pulled a 19-year-old firefighter from the rubble. 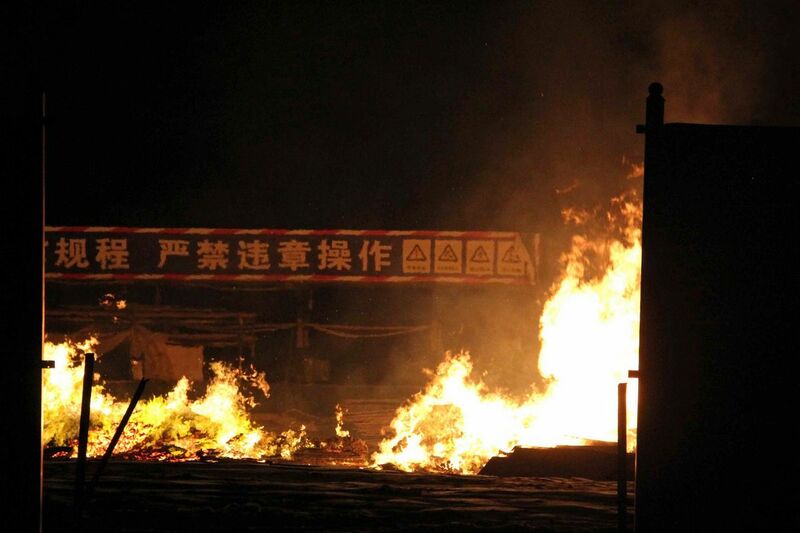 Online commentators expressed fury at authorities, who are regularly accused after disasters of cover-ups. 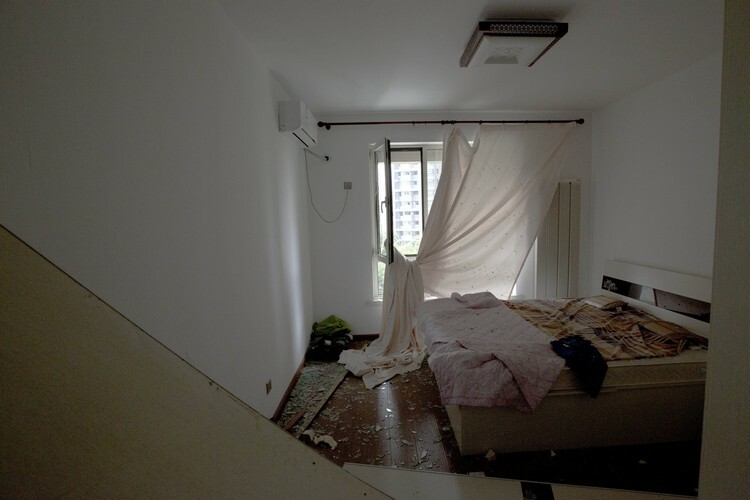 “Please be honest and say what you know. 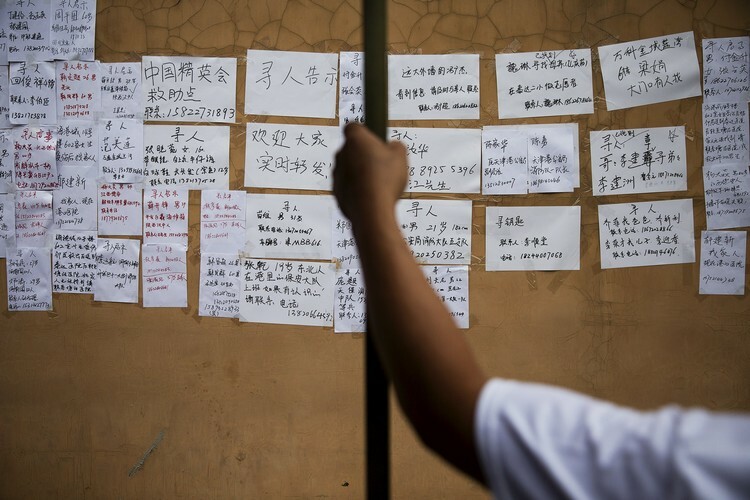 Don’t hide the truth!” one poster urged on social media. 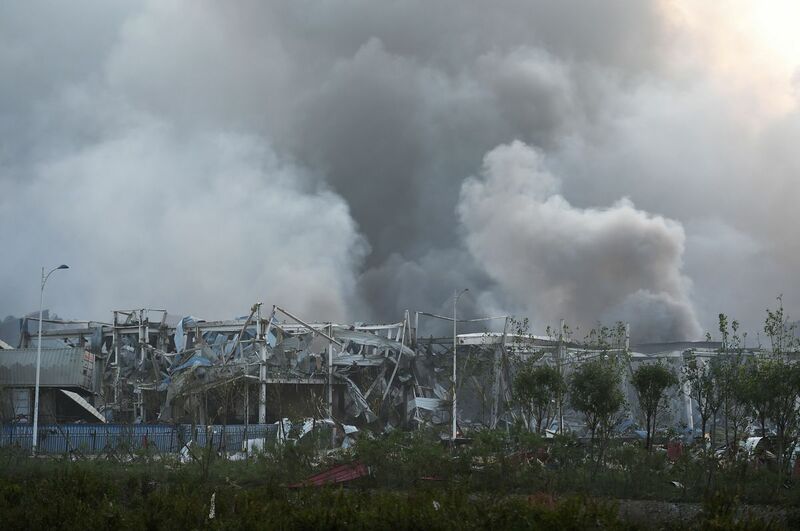 A massive explosion hit a "dangerous goods" warehouse in Tianjin, China, on Wednesday, killing at least 50 people and leaving emergency services staff trapped in the rubble. 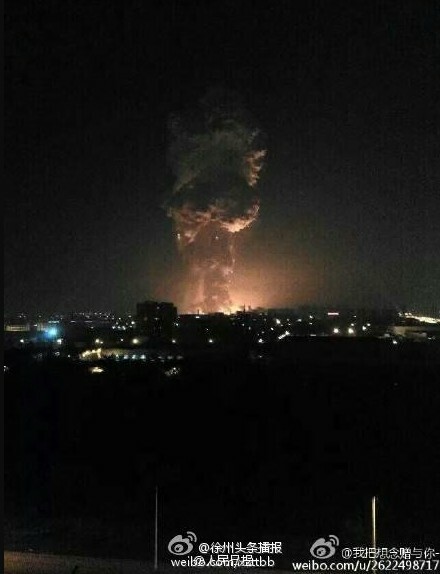 The explosion in the Binhai New Area on the city's coast happened at about 11.30pm local time, with videos posted on social media showed a towering inferno above one of China's largest urban areas. 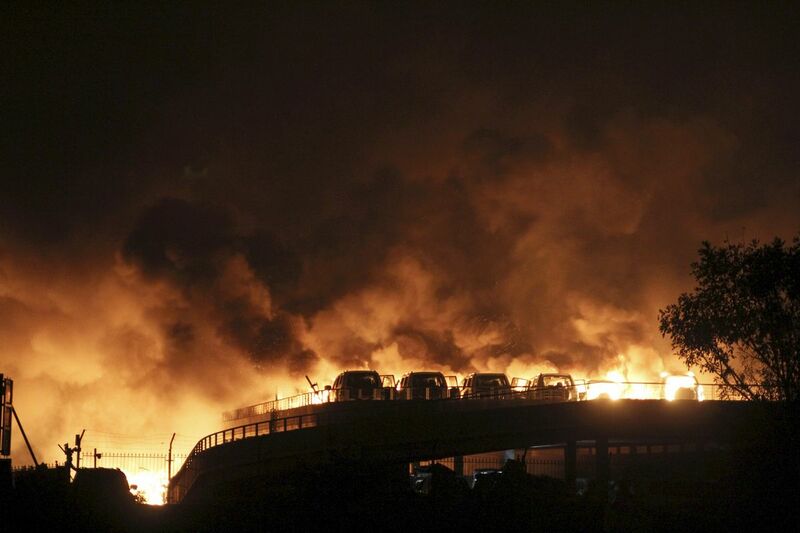 Reuters cited a statement by the city's government that 50 people were confirmed dead - including 12 firefighters - and as many as 700 injured, over 71 seriously. 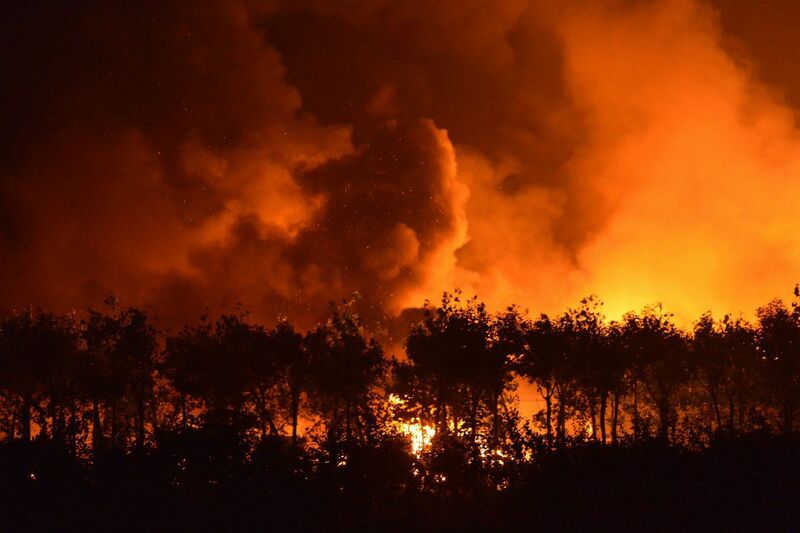 China's CCTV reported the toll on Twitter, adding that President Xi Jinping had urged "all-out efforts to rescue victims and extinguish fire," as a blaze continued to rage at the site where more people were feared to be trapped. 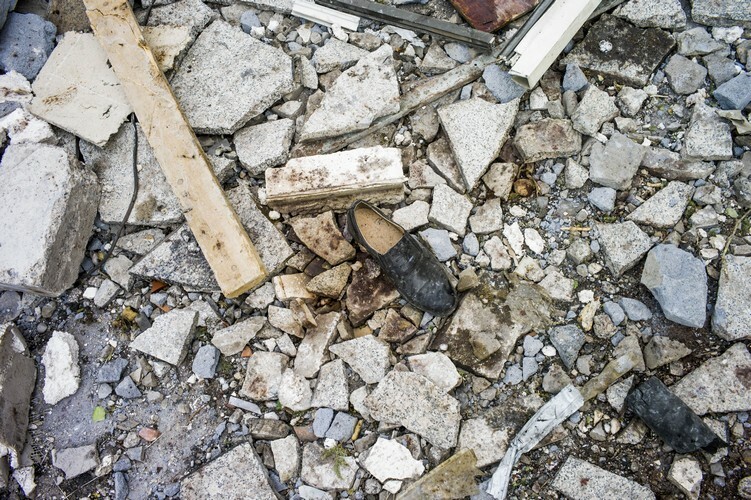 An AFP reporter at the scene observed shattered glass up to 3km from the blast site, after a shipment of explosives detonated in an industrial zone, raining debris on the city. 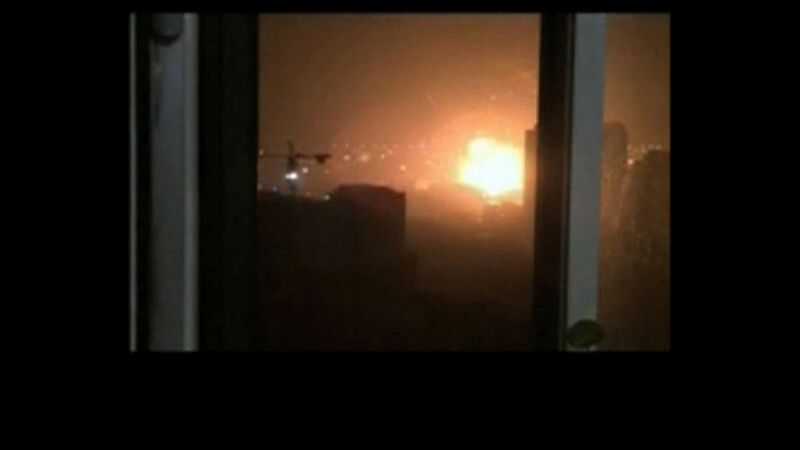 Plumes of smoke billowed over buildings six hours after the explosion, which occurred around 11.30pm local time (12.30am on Thursday Singapore time). 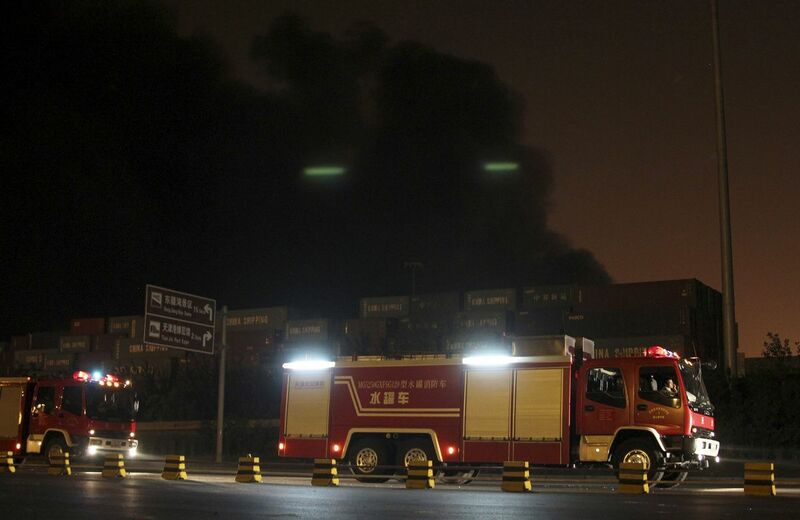 Two firefighters called to the scene were missing, Xinhua said, as 10 emergency teams and 35 fire trucks battled the blaze. 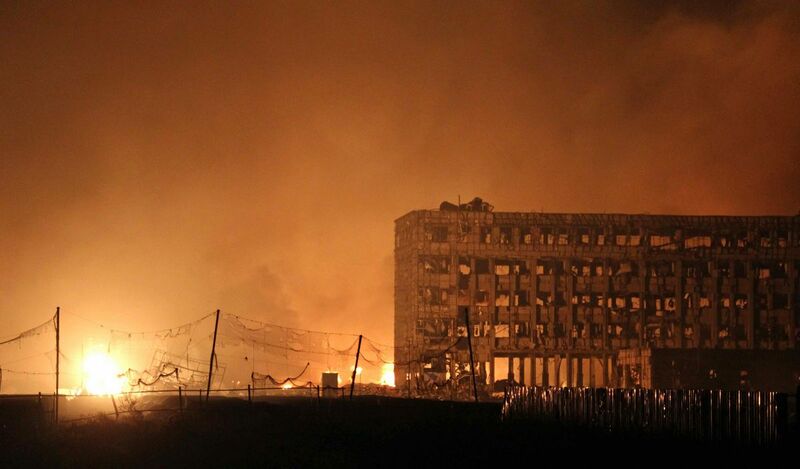 Much of the area surrounding the explosion is made up of construction sites for residential and office buildings. 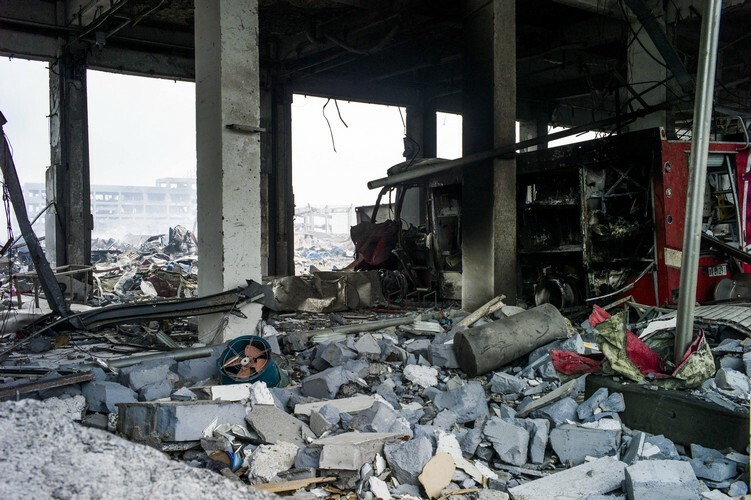 Worker dormitories, built of flimsy sheets of thin metal, were torn apart by the blast. 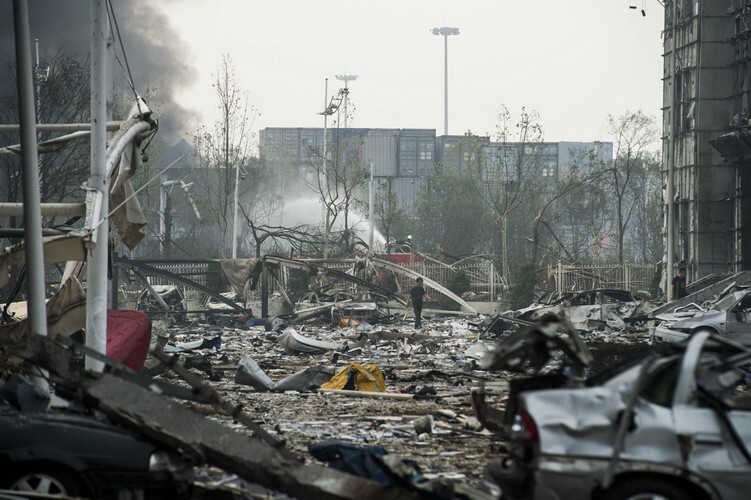 The magnitude of the first explosion was the equivalent of detonating three tons of TNT, the China Earthquake Networks Centre said on its verified Weibo account, while a second was the equivalent of detonating 21 tons of the explosive. 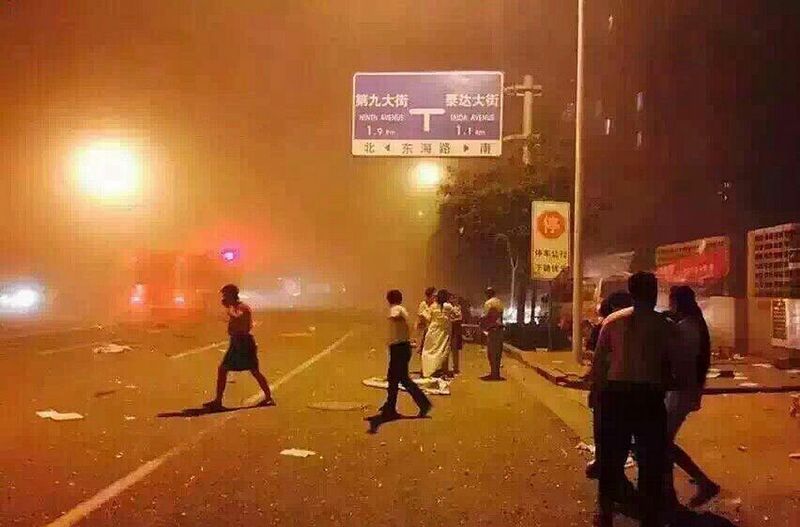 Images obtained by AFP showed residents, some partially clothed, running for shelter on a street strewn with debris. 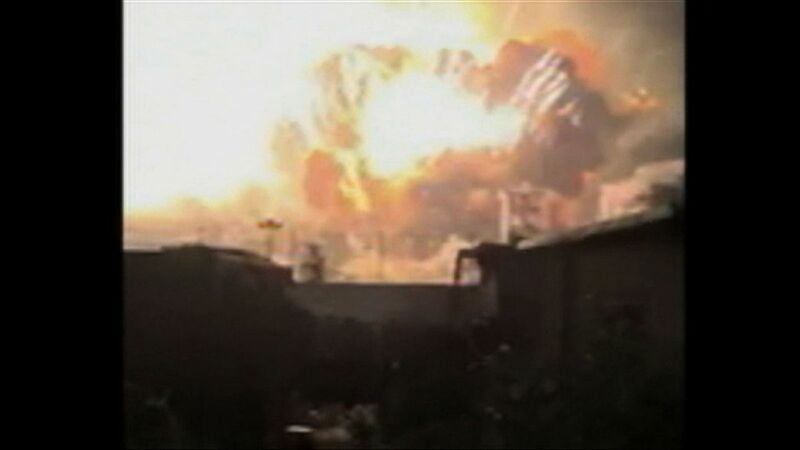 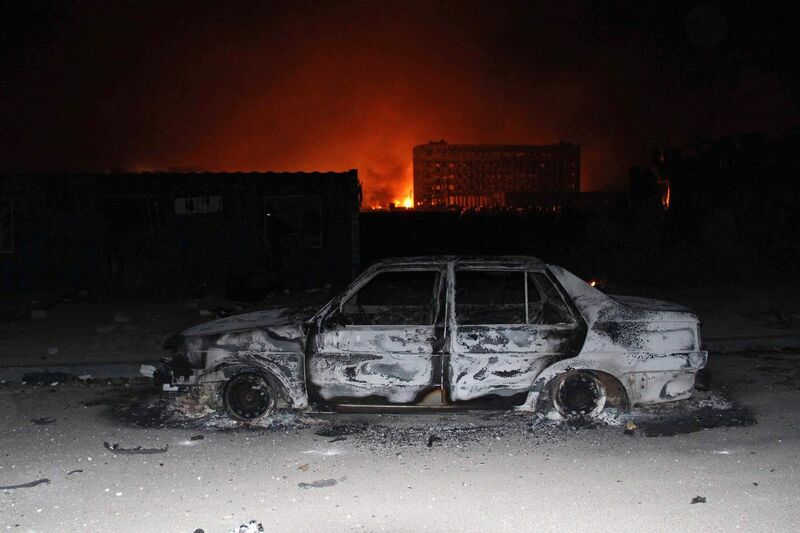 One of the explosions was equivalent to detonating 21 tonnes of TNT. 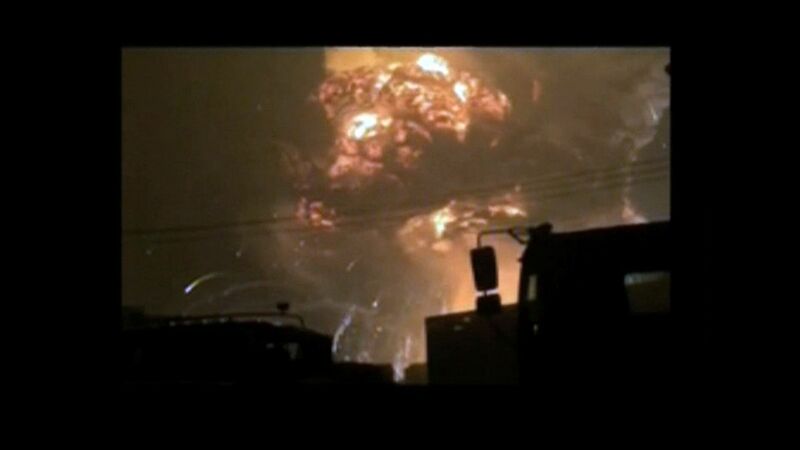 The impact of an enormous fireball was felt for several kilometres. 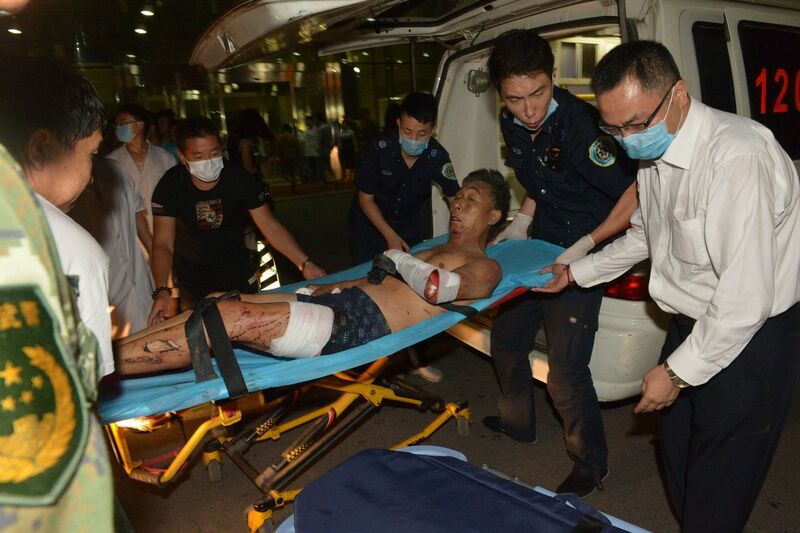 A doctor wept as the body of a firefighter still in uniform was wheeled by, his skin blackened from smoke. 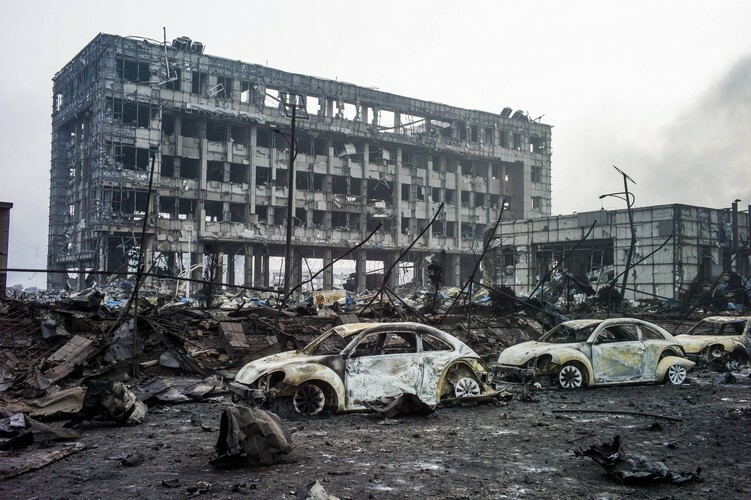 Alongside the pristine new buildings that epitomise China's rise sat twisted metal, torn off roofs and burnt out huts. 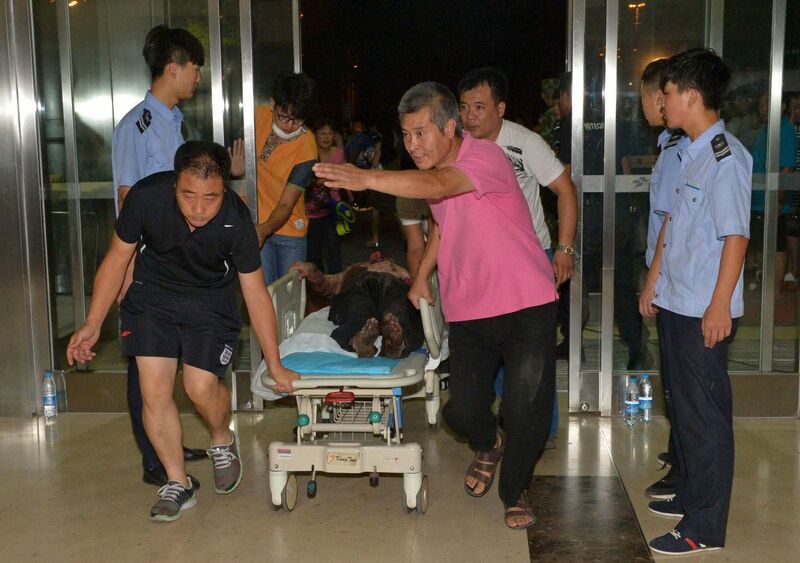 "The explosion was terrifying, and I almost passed out," a security guard told AFP. 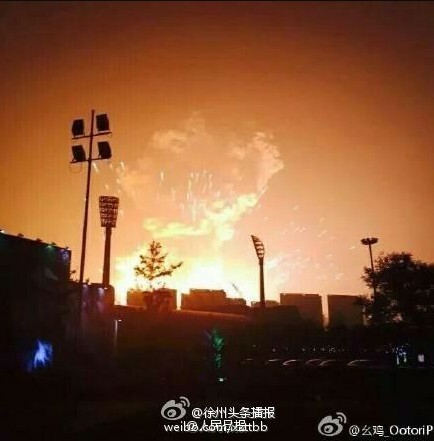 Communist Party newspaper the People's Daily said 13 people were killed in the explosion in a post on Chinese social network Weibo, adding in a separate post that more remained trapped by a huge fire unleashed by the explosives. 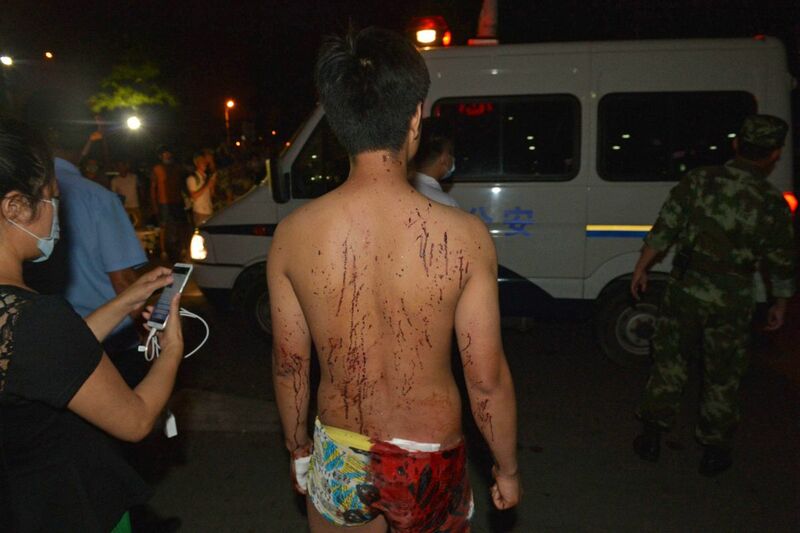 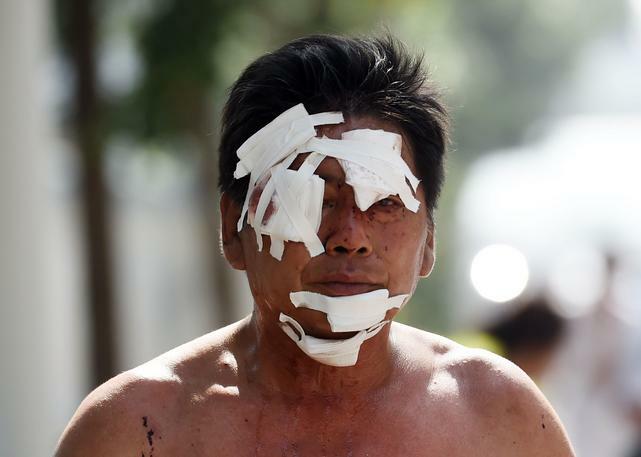 An injured man walks out from a residential area near the site where the explosions occurred. 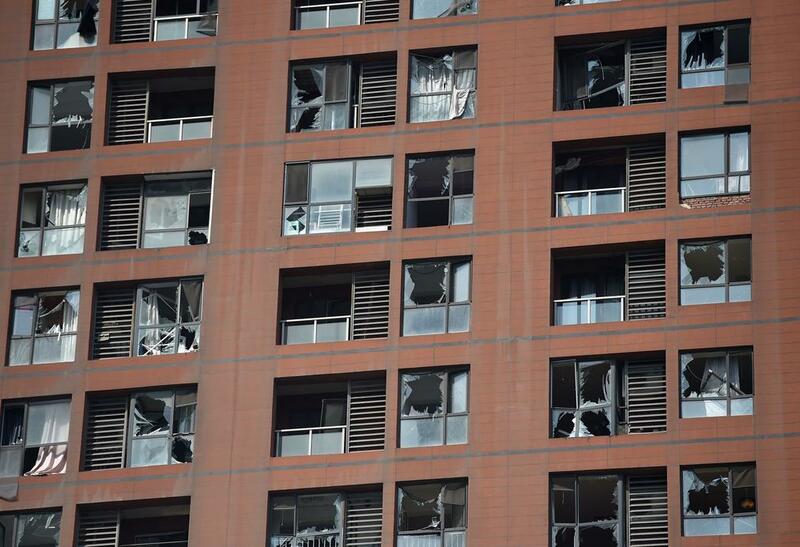 Shattered windows are seen on the facade of a residential building near the explosions. 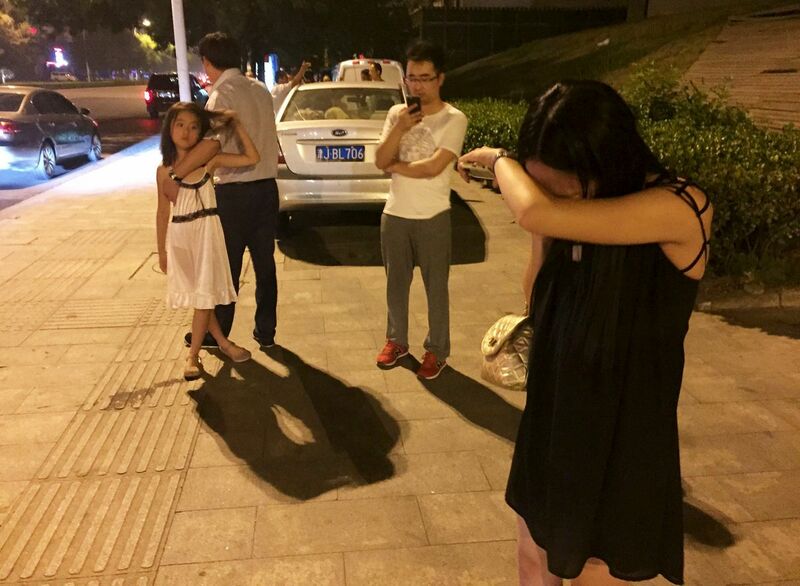 A mourner at a tribute spot. 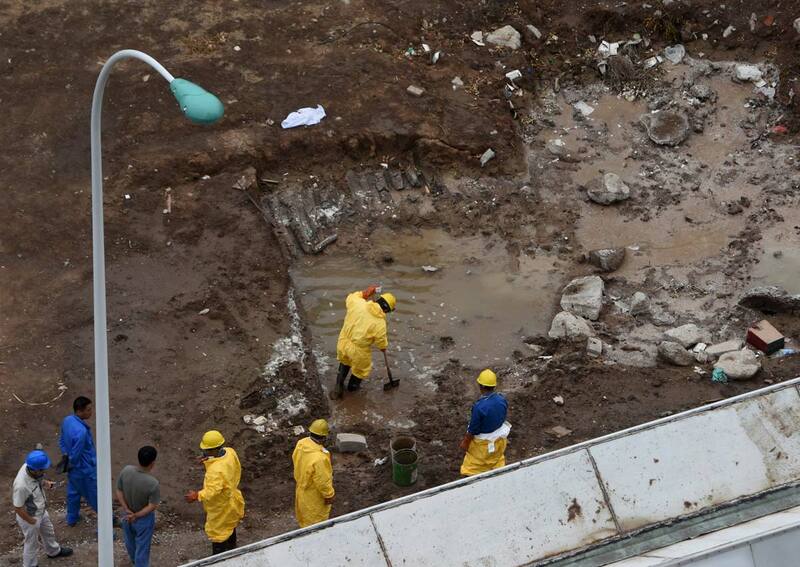 Workers remove polluted water at the blast site.